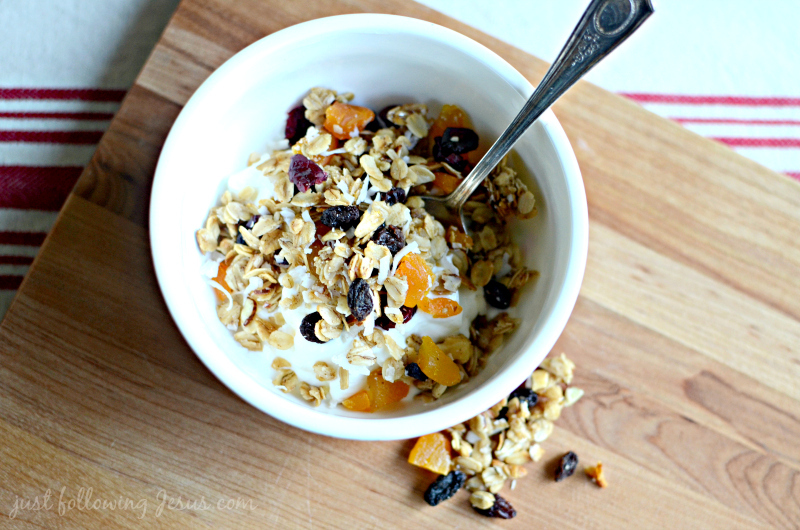 Just following Jesus in my real life...: Friday's Faves...a delicious, nutritious, hearty, homemade granola recipe! 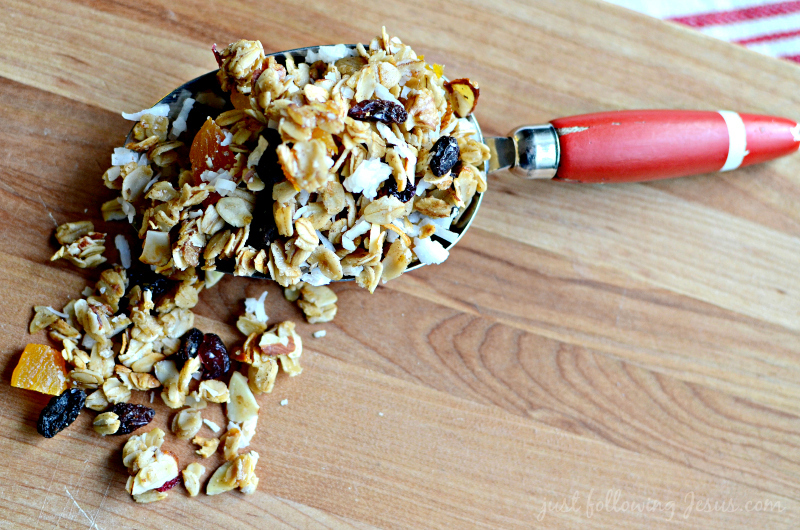 Friday's Faves...a delicious, nutritious, hearty, homemade granola recipe! I don't know why, but my favorite store-bought granola recently doubled in price! I decided to finally go ahead and make my own granola using her recipe. I, as is my usual way of cooking, made a few changes to her recipe. Here's her recipe, with my changes in parentheses. Pan spray two cookie sheets. 4 cups of chopped pecans (that's a lot of nuts, which are pricey. Divide the mixture between the cookie sheets. Bake for 15 minutes, stirring occasionally. stir and return to oven for 15 more minutes until the mixture is golden brown. To the entire batch, stir in 2 cups of dried fruit. 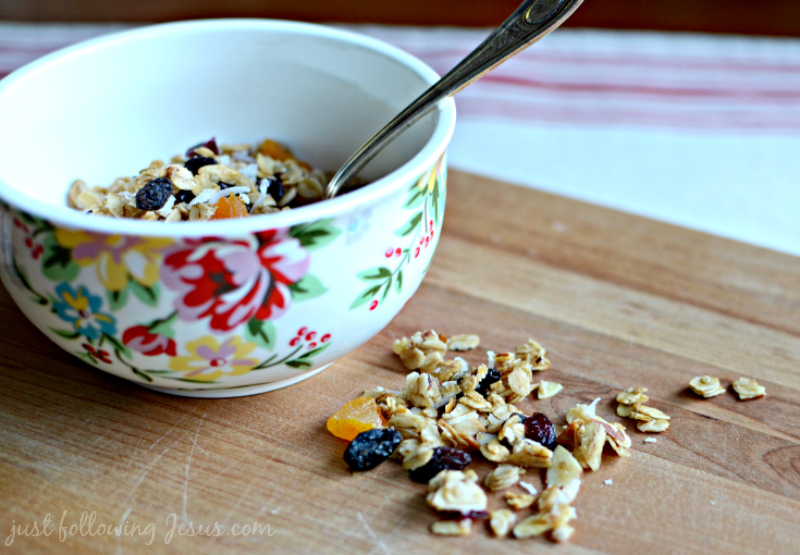 (I used a combination of chopped dried apricots, raisins and dried cranberries. This is delicious for breakfast on top of some greek yogurt. Oh Yum! Love Granola! Always looking for new recipes. Thanks! You are such a Blessing in my life! And you bless me too, Carol! Sounds yummy! And your little bowl is so pretty, no surprise there! I'm a shameful hoarder of cute cups, bowls, etc! You should make the plain kind for them and some loaded with the extras for you! So yummy! Much better than store bought! This looks delicious, Elizabeth! 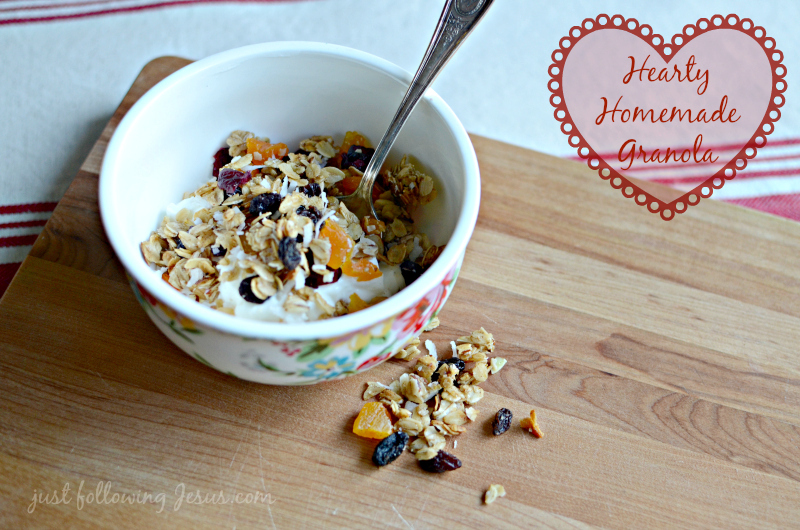 Homemade granola is one of my favourites. I'm sold on making my own now! Thanks for your recipe. I love the last photo! Well Elizabeth, I was just having a grumble this morning about the price of what you call Granola. We call it muesli here in Australia. I'll be giving this recipe a try for sure. 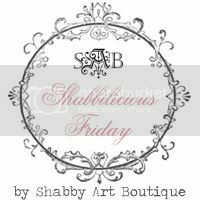 Thank you and thank you for linking up on Shabbilicious Friday.